It was almost Chinese New Year (somewhere Dec 2011) and I have a lot of prawn shells in the freezer that needs clearing up. I’ve never made prawn noodles before and I’ve been planning for my maiden attempt since months ago. I finally made it when I got some nice fresh prawns again. I thought it’s difficult. But hey no, it took me just a little while to make this for dinner. The most difficult part could be cleaning the shallots and that’s just it. The rest was quite a breeze. I used so much prawn shells and heads, that the soup tasted very very nice with no usage of chicken carcass or stock cube. None at all. I referred to these 2 websites to get a general idea and came up with this. Delicious! I know some of you might find it weird to have pork slices, but in my hometown, we do have this with our prawn noodle at Malai Wong. I see them fishing out huge slabs of pork loin and slicing it later. 1. Put water into a large pot and bring to boil. Put in pork loin. 2. While waiting for the water to boil. Fry shells. Put prawn shells into wok and fry until no more juices come out and looks dry. Pour in oil and on medium heat, fry until the shells are very fragrant and has all turned pink/red/orange. 3. Place all the fragrant prawn shells, onion, garlic, and wine into the boiling water. Bring back to a boil and lower to a simmer on medium low heat for 30 minutes. 5. Bring the broth back to a boil. 6. Snip feelers off prawns and put them into the pot of boiling broth. When the water comes back to a boil, fish out all the prawns, set it aside. 7. Thinly slice the pork when it has cooled down. 8. Season broth with salt and turn off the heat. Reboil when it’s almost time to serve. 1. Grind chillies, shallots and garlic to a fine paste. 2. Heat wok with oil, the put in the chilli paste and salt and cook it on medium heat until it looks almost dry(still pasty) and glossy. 3. You can either put this into the soup (after boiling the prawns) or keep this for personal addition later on. I use a noodle strainer to do this for single portions. Place a handful of beansprouts and some water convolvulus into a strainer. Top with rice vermicelli + yellow noodles. Dip the strainer into the boiling water for a few seconds and pour the contents into a noodle bowl. Put 1tsp chilli paste and some white pepper onto the noodles, ladle the soup over the paste to dissolve. Top with eggs, prawn and pork slices. Lastly, sprinkle on fried shallots. Thanks for sharing this delicious prawn delight. I love prawn noodles! I've got a tiny collection of prawn heads...waiting for the day it will multiply so I can make some prawn stock =P hehe. Thanks for sharing! Looks too appetising! just ask u for a bowl. Lol :)) that's why I said u r a genius. In the first photo, the prawns are jumping out at me! I love prawn noodles especially with the sambal. Aiyo, cannot tahan. I thought sliced pork loin is standard, as that's the way I cook it too, learnt from my Mum who hails from Penang. Maybe the Northern way. Sliced pork is standard here too. Some have pork ribs (pay more) as well. Hokkien mee!! Yours definitely better than those sold outside, I am sure! Wendy I can slurpp two bowl. A lot of kung fu to do right? making the soup ain't easy. Look at the photos presentation so tempting. ooooo... I just finish my lunch hour but still thinking to go eat prawn noodle after seeing all your photos! Hehehehe.. your prawn mee has got a few missing ingredients and these are essential. 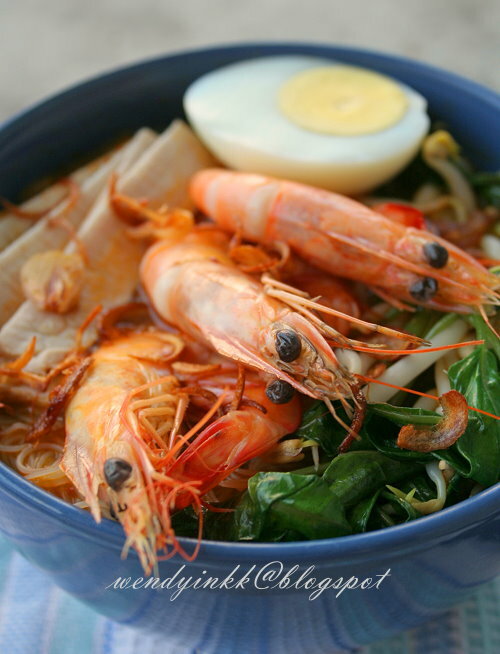 The skill of prawn mee is the soup. The food looks amazing here. Nah, forget about it. U invited urself into my dungeon, now and forever, ahaha! the more heads the better! jiayou! Was ur bowl of noodles able to satisfy the craving? hehehe. make sure u catch them! u too ah? heheh, ganbatae! My MIL was shocked to see pork loin, haha! ok la, not difficult actually. I wonder which yardstick did you use to compare my prawn mee with so that it should have a list of standard ingredients? My broth is made so so much prawns heads that it doesn't need budget flavour fillers like jicama or spinal bones. I never mentioned this is Penang version or anything related to it. FYI, the Cantonese also makes prawn noodles, with a clear broth that is not spicy at all. 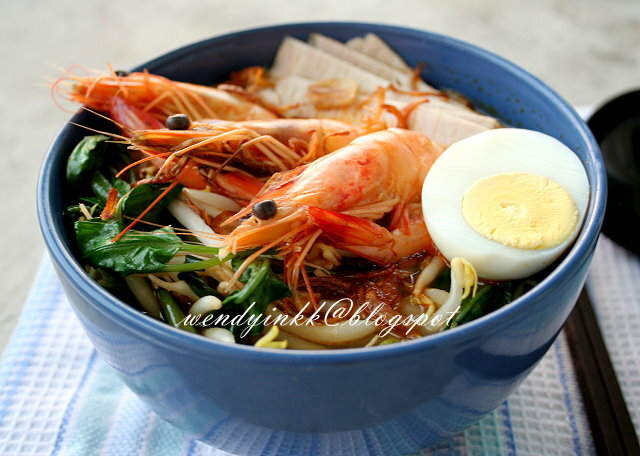 If you think this recipe is not as good, I hope you can provide me with your ultimate recipe so that I can make the best prawn mee and credit it to u.
I was thinking of throwing away my prawns shells which are still in the freezer....maybe I shall think again:) Your noodles looks authentic! Wendy, I am drooling over here, must go and hunt for it for lunch later! Thanks for your wonderful prawn noodle recipe. I tried it the day I read your sharing. Unexpectedly delicious because I use not so many prawn shell. 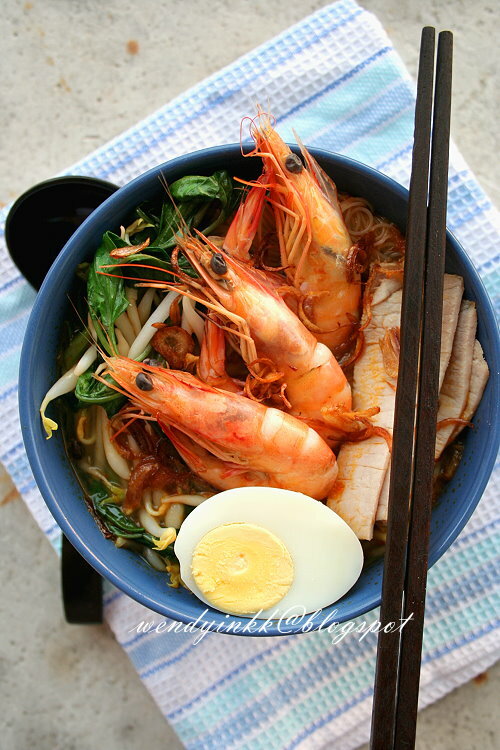 Simple ingredients but delicious homemade prawn noodle. I just use an hour to prepare it for lunch. Can't believe the soup was so tasty (without additional stock cube) and with nice prawn smell. Thank you very much. got prawn got noodle, so that's prawn noodle lor, right, LOL. That's the most standard ingredient, any other else is up to the individual, unless it carries a tag of which type of prawn noodle this is. thanks for trying out this noodle, I'm glad you found it tasty. Homemade stuff should be easy and delish! Wendy, how to clean up the prawn head before cooking? Normally I throw it away. Just rinse it? If i want the shells for making noodles, I wash before I peel. After peeling, I no longer wash and keep them straight in a tupperware. Don't rise all the creamy stuff away from the heads, that's flavour. i'm also in the midst of collecting the shells, dont know whether jadi or not jadi..just keep our first! our prawn mee here also comes with pork slices and also yue paeng.